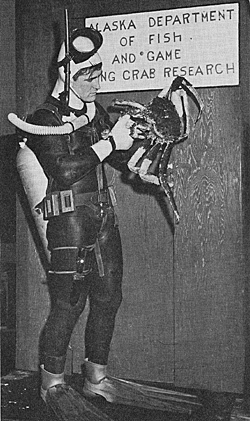 Department biologist uses scuba diving gear as an effective research tool. Alaska became a state on January 3, 1959, and Governor William Egan named C.L. "Andy" Anderson as the first Commissioner of the Alaska Department of Fish and Game. In 1949, the Territorial Legislature created the Alaska Territorial Fishery Service in an attempt to influence federal management practices that had decimated salmon populations in Alaska. The Territorial Fishery Service had no authority, but they commented on federal regulations, conducted research, and tried to influence the federal managers. In 1957, in anticipation of statehood, the Territorial legislature expanded and renamed the Alaska Fishery Service to the Alaska Department of Fish and Game. C.L. "Andy" Anderson had been director of the Territorial Fishery Service since 1949 and continued as director for the new organization. Andy hired Jim Brooks to organize the Game Division, Walter Kirkness to organize the Division of Commercial Fisheries and Ed Marvich to develop a Sport Fish Division. These four men began to hire staff in 1958 and decide how the department would be organized. In 1959, the first state legislature established the Department of Fish and Game. However, full authority could not be granted until January 1, 1960, when the regulations and statutes were in place. They gave the commissioner great authority to manage the fish and game resources. Alaska Statute 16.05.020 stated the commissioner shall: (1) supervise and control the department and may employ division heads, enforcement agents, and the technical, clerical and other assistants necessary for the general administration of the department; (2) manage, protect, maintain, improve, and extend the fish, game and aquatic plant resources of the state in the interests of the economy and general well-being of the state; and (3) have necessary power to accomplish the foregoing including, but not limited to, the power to delegate authority to subordinate officers and employees of the department. The first state legislature also created the Board of Fish and Game and the fish and game advisory committees system. The Board of Fish and Game consisted of nine citizens appointed by the Governor and confirmed by a majority vote of the legislature. In spring 1975, the legislature separated the Board of Fish and Game into separate Boards, which continues today. The Boards have responsibility and authority for establishing regulations and allocating the fish and game resources among the various user groups. The Boards do not have any responsibility or authority for personnel or budget decisions in the Department of Fish and Game. This authority and responsibility is reserved for the Department Commissioner.